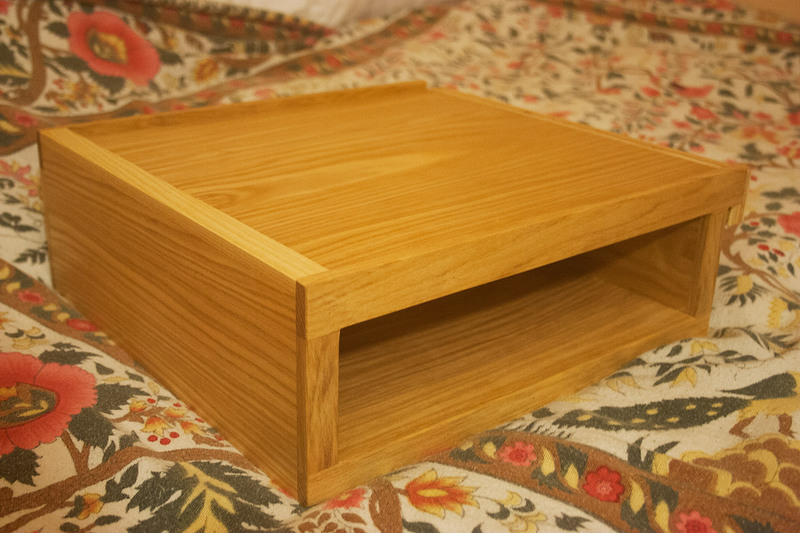 There are two options for nightstands: the traditional free-standing style and my own clip-on variety. Either type can be made with a built-in wireless phone charger if you desire. 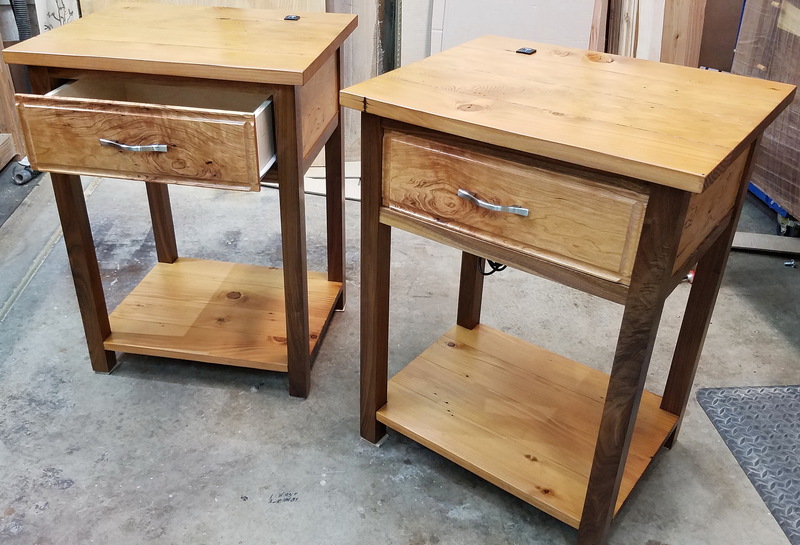 So far I have made the pair of nightstands you see below. 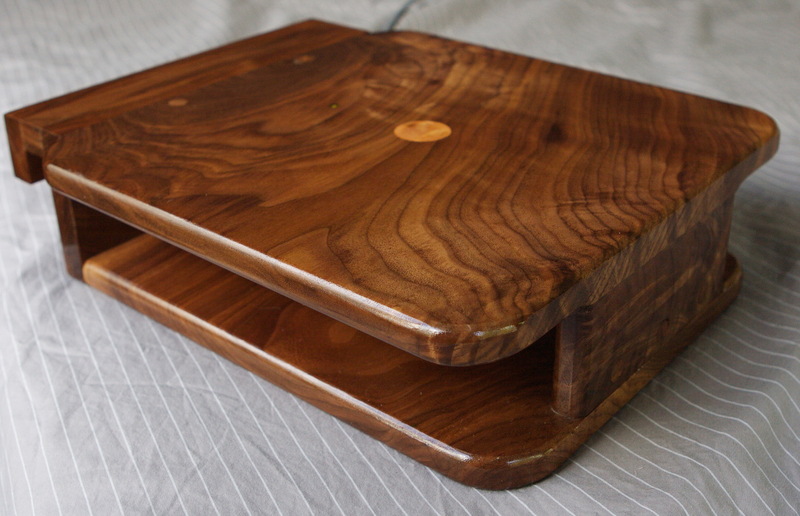 They are walnut with “rustic” cherry inset panels and customer-supplied salvaged fir tops and shelves, with a drawer each. 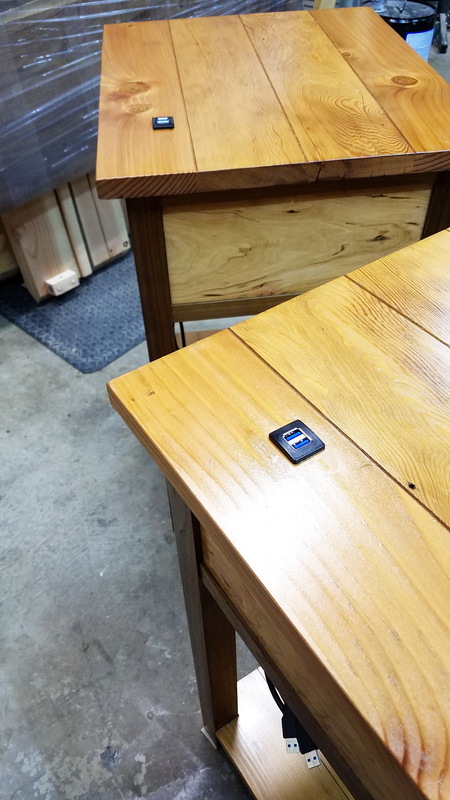 Each one has dual USB charging ports set into its top (the customer didn’t want wireless chargers). 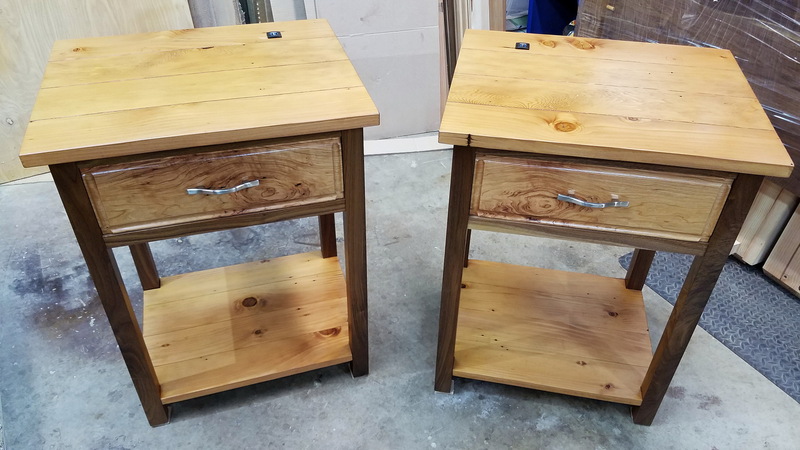 As usual, they’re exceptionally well made, with 76 mortise-and-tenon joints between them, and allowances for seasonal movement of the horizontal surfaces. I can make something similar or totally different for you! 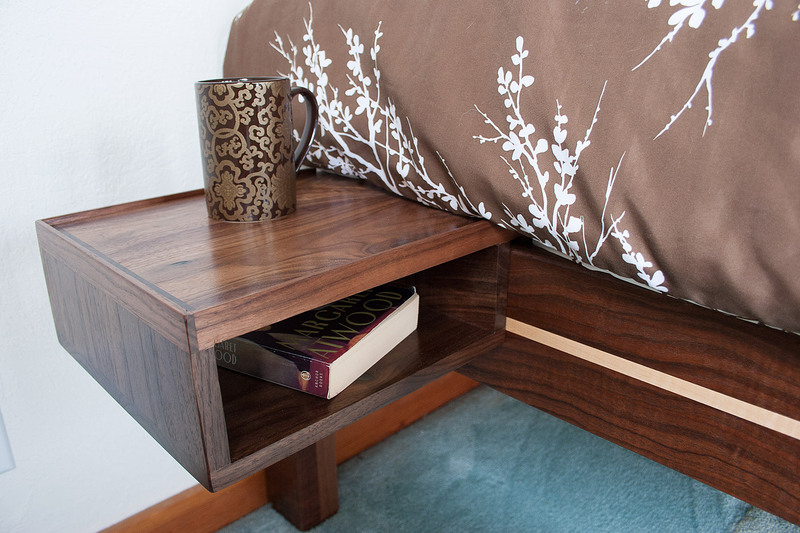 If you want a nightstand and like an uncluttered appearance and/or want to save floor space, take a look at my clip-on night stands/shelves. They hook on to the lip on the top of my bed frames so they can be placed anywhere on the frame. The new version of the shelves is in the first two photos below, and the older design is in the other photos. 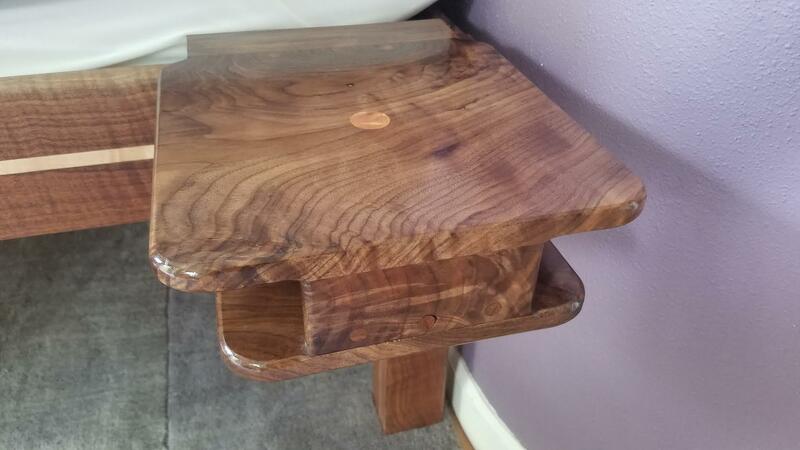 There is a wireless phone charging coil underneath the curly cherry circle in the top surface of the shelf in the first two photos. To charge a compatible (Qi-enabled) device, you simply place it on the circle, the LED next to it lights up, and charging begins! 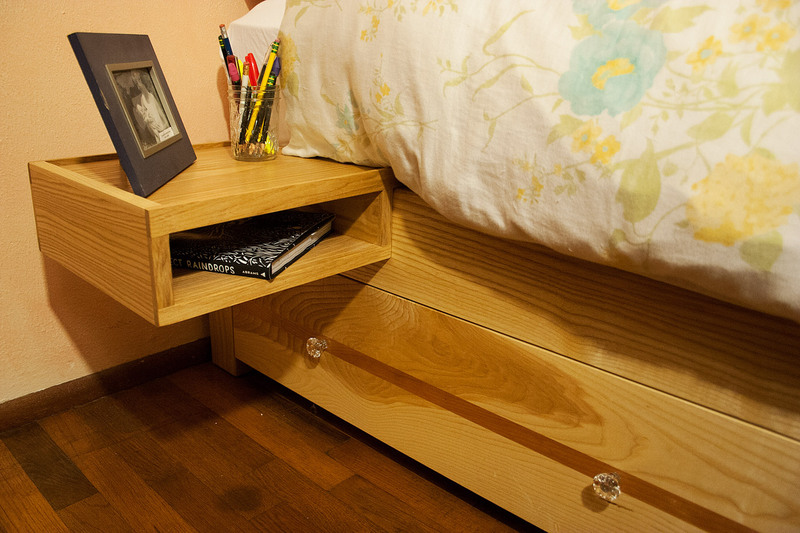 Also, because technology changes, the shelf is designed to come apart so the electronics can be upgraded. You can get a clip-on shelf of either the new or original design without the wireless charger if you don’t want it. Due to the weight of it, the lack of availability of fir plywood that matches the fir frames, and my insistence on never making something that could break (I’m not 109% certain that the lip on a fir frame could hold the weight), these shelves are available for hardwood frames only.